JULIAN STATION: The Lacemakers & BBQ Tri-tip on Sunday! The Lacemakers & BBQ Tri-tip on Sunday! The Lacemakers describe themselves as "interlacing Celtic, traditional and original music." 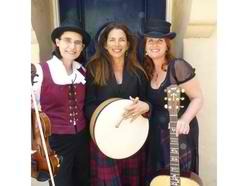 The band features Heloise Love, a long-time Julian favorite, along with Miss Darla and Kim Donaldson. Add BBQ Tri-tip and we have a perfect Julian afternoon. We hope to see you Sunday at Noon.